WOW! Is the best description for this one. Outstanding waterfall almost all year but especially during the spring snow melt when this cascade plummets over 500 feet to the access trail below. Most travelers coming from Lake Tahoe have seen this one, it’s quite the distraction from Highway 50. Directions: Go 2 miles east of Strawberry and you can park at the designated parking lot ($5) at Twin Bridges. Very popular on weekends. The developed parking area was built due to the mess of cars that used to vie for a parking space along the highway here. 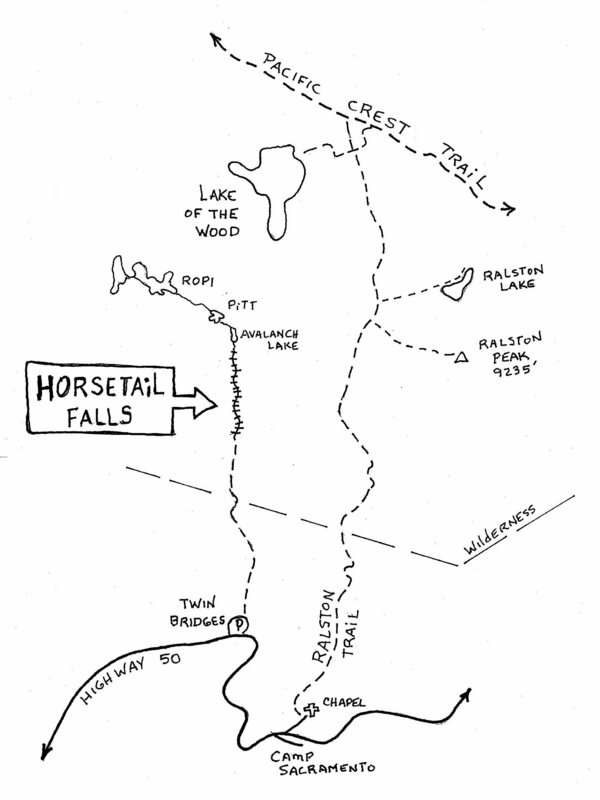 The trail is evident and goes 1.4 miles to the base of the falls. Nearby the short alternate way, Pyramid Creek Trail, follows the creek for a bit longer hike that also sees another 40’ waterfall along its way. Before you reach the base of the falls you will enter the wilderness area and so you will have to fill out the free permit before going further. Visible along the hike are “chatter” marks in the granite that are evidence of the glacier that scoured out this canyon ten thousand years ago. They’re made by rocks trapped under the ice that gouged the rock surface. An “unofficial” steep and rather dangerous ducked route climbs up beside the falls and reaches Ropi Lake and a string of smaller lakes along the route. Danger! People have died here from falling off the slippery polished granite rocks going up to the upper end of the waterfall. It is a steep rock climb of sorts but does give an added perspective to this exciting display of falling water.